Philip Lessen at Google Blogoscoped points to a secret testing URL for a preview release of the latest GoogleTalk client. As well as allowing you to select a 96x96 avatar to represent you, Google has provided a number of new options for how you wish to view your conversations. Personally I like the look of 'SerenePicture'. Overall a good improvement I think. 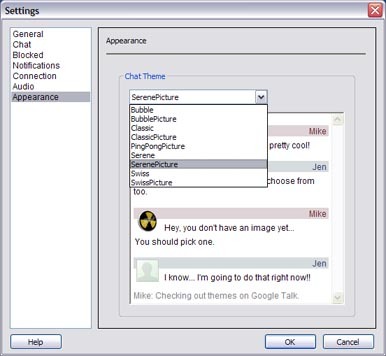 Keeps the simplicity of GoogleTalk but adds a bit of color.